Friday, I bought six books. I was happy to find some books I was looking for. I sometimes go to BOOK OFF to buy book less expensively. In BOOK OFF, there are some shelfs in which books are displayed sell for only 105 Yen. By the way, I need new shelf to store all my books and CDs. In my room, there are more than 100 books and more than 200CDs and some DVDs. Every April I see many freshman on campus and I remember the time when I was freshman. Although my university wasn't my first choice, I was happy to been unversity student and I was planning to study hard and get good grades. Do you have any advice to make my father quit unhealthy habit ? It will be took place in Korea at this September. I've really influenced by that book. The author, Robert Kiyosaki, also made GAME called CASH FLOW to help people to get to know about Rich dad's mind. There are many study session about that all over the world, of course in Japan too. I have to take medical check up. I went to part time job. I'll use funding system, so I can start investment more easily. I'm worring about cherry blossom ... Because I'm planning to do HANAMI party this weekend. We're going to make new band mainly play JAZZ/Fusion. We talked about some band we interested in. After that we went to nearby Chinese restaurant. 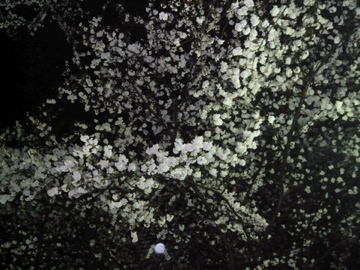 After we ate dinner, we went to University again(10 p.m) and took picture of cherry blossome.